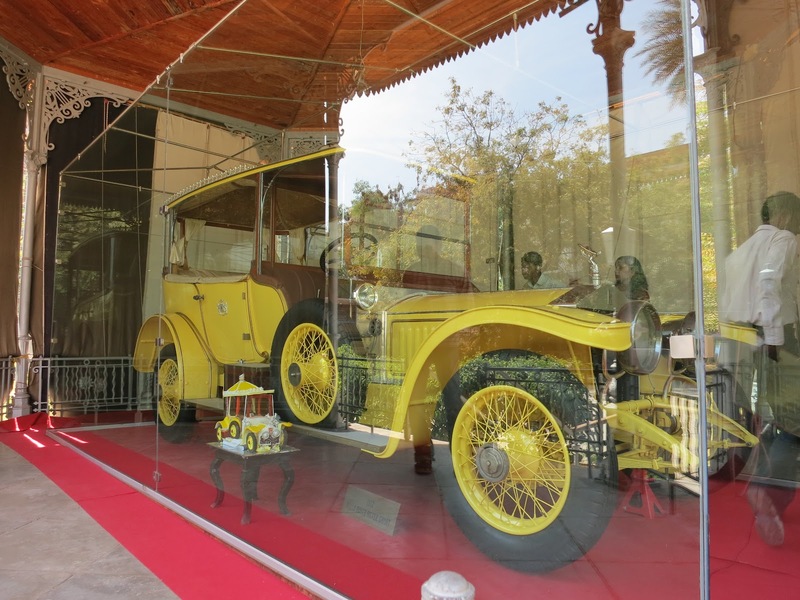 Nizam's Yellow Rolls-Royce with 350 miles on it! 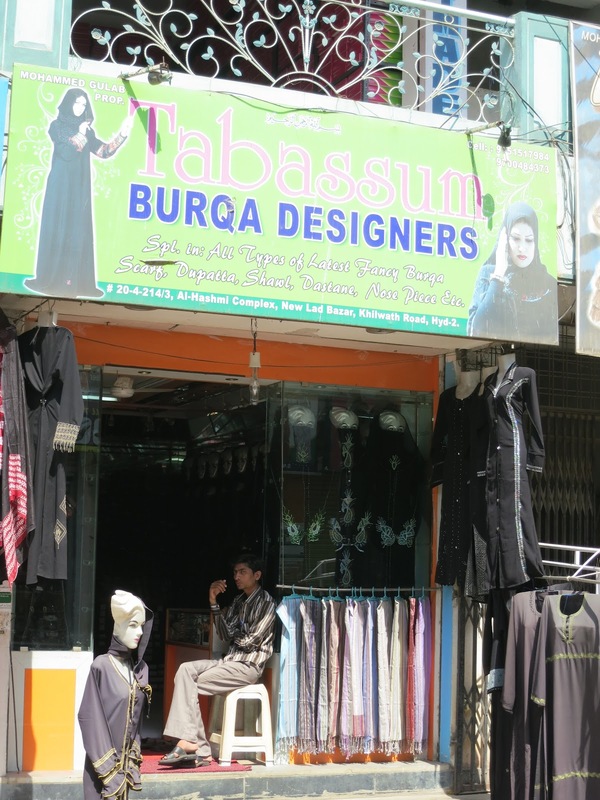 Do you want your Burqa in Black or in Black? Full Moon Shines down on us! 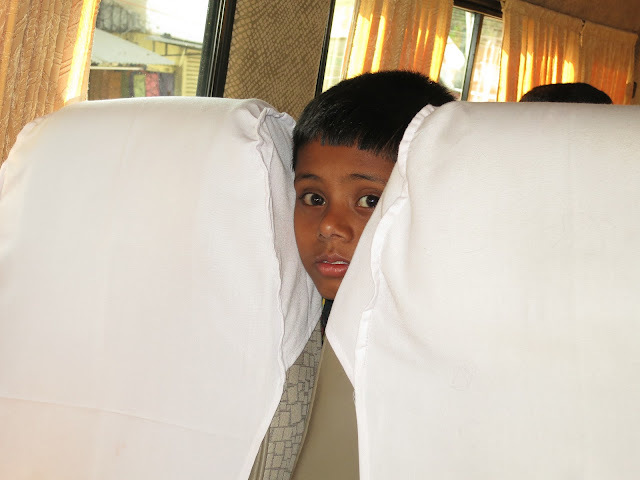 We then had the best surprise of our trip. Lakuma surprised us with a visit with her husband, Giridhar, and 12 year old son, Mittu, who is an adorable kid. We gave them an iPad as a gift and the son immediately started playing with it. It was amazing, it was entirely intuitive for him. The three of them are like family to us, and we all toured the city together (driving through the congested streets at a very slow pace). 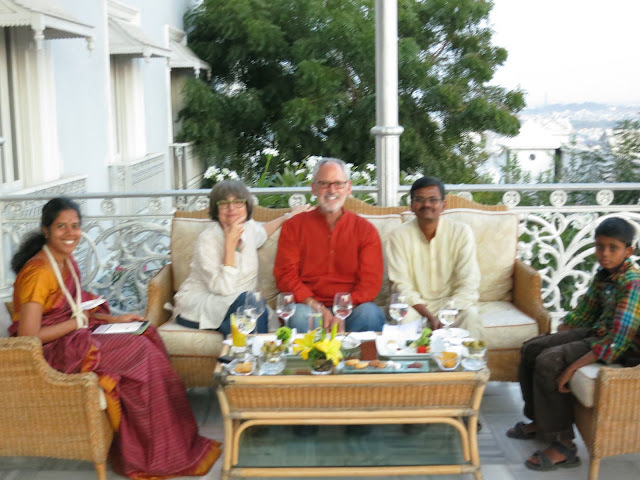 We had a private tour of the Falaknuma Palace. 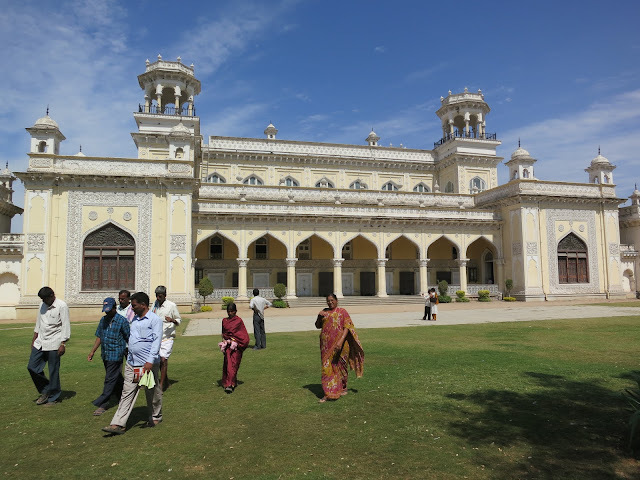 The Nizam of Hyderbad didn’t build this palace but aquired it when its owner when bankrupt. 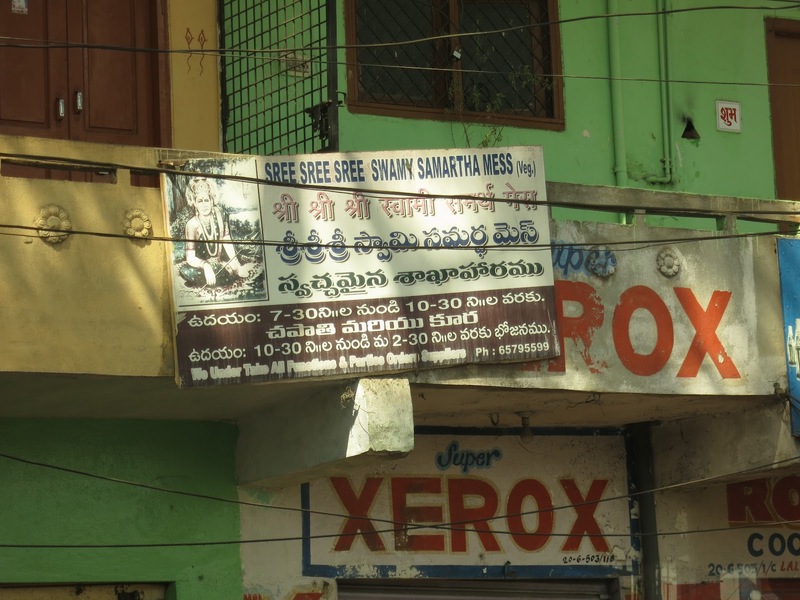 I guess that is why the Nizam was long considered the richest man in the world. He loved Jewelry. He owned a huge diamond that he used as a paperweight. After he died, his son found it stashed in a shoe. The diamond is valued at over $ 100 million dollars. The palace has all of the original furniture which has been painstakingly restored. 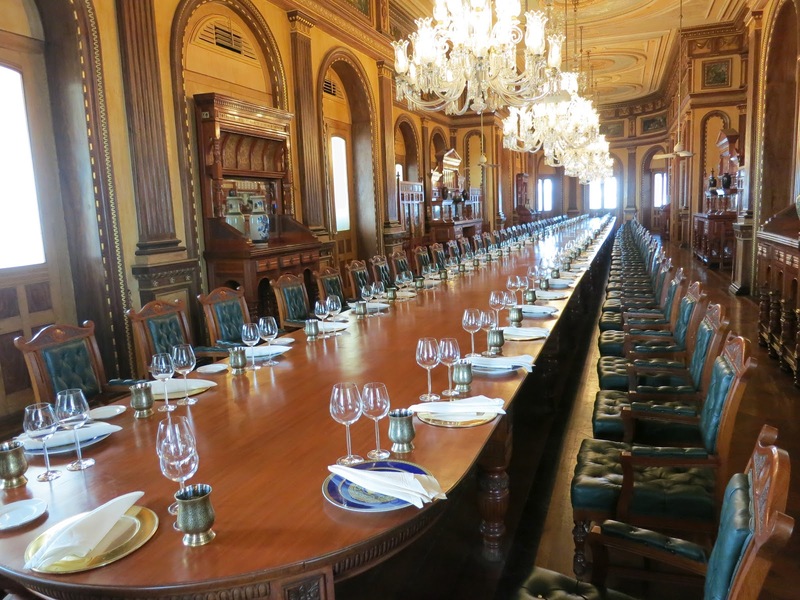 The great dinning hall has the longest table in the world and is still used. 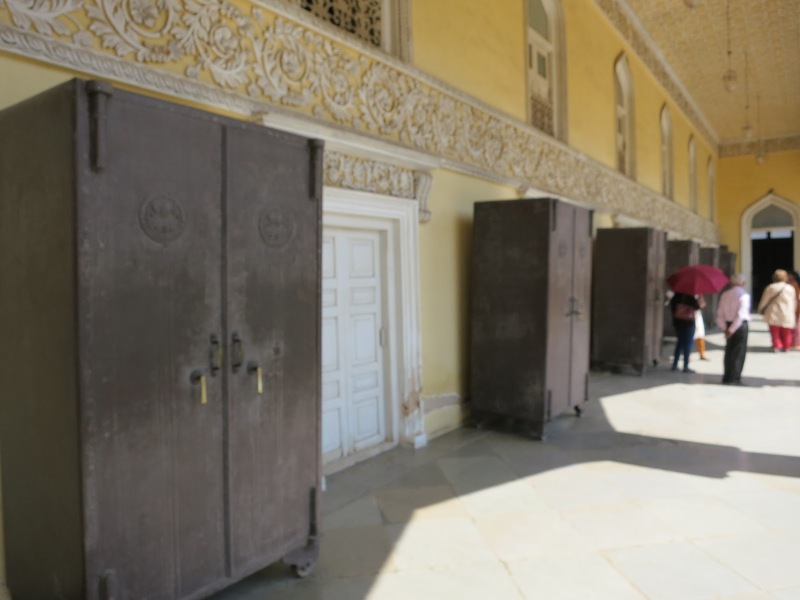 It seats 100 guests and the Nizam for a total of 101. There is no food passing here. Each guests has a butler and everyone is served at the exact same time. 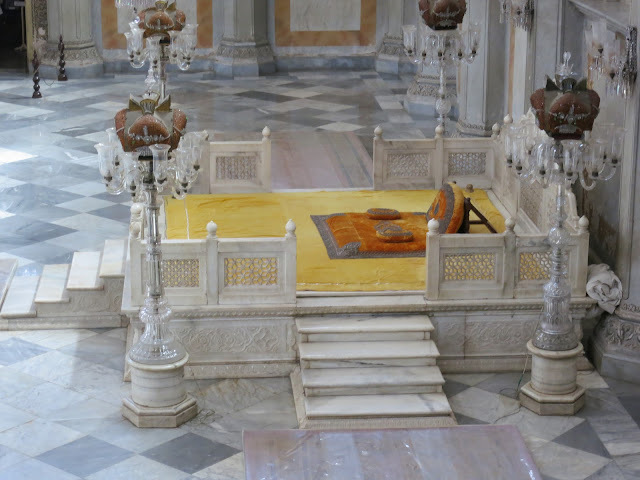 The Nizam has a gong by his chair, and when he bangs it the 101 butlers serve the 101 guests simultaneously. Notice I am saying all of this in the present tense not the past tense. The Nizam of Hyderabad still exists, he is enormously wealthy, still owns this Palace (and much more). The Prince of Hyderabad was eating breakfast at the next table to us this morning. 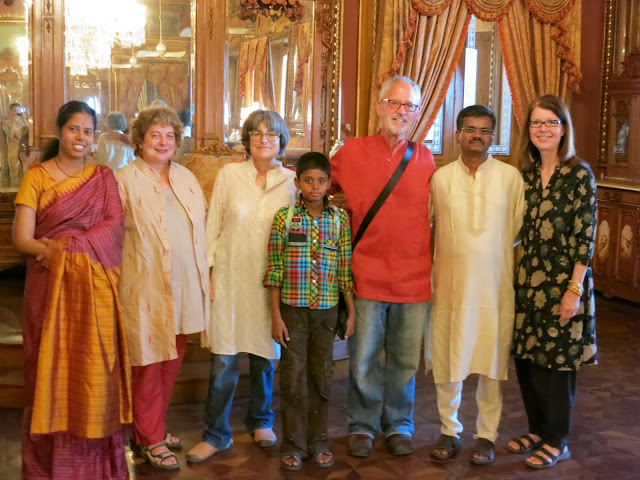 After the tour we all went to another Palace he owns called the Chowmahallah Palace. My favorite object in the entire palace was the Nizam’s 1912 Yellow Rolls-Royce. It only has 350 miles on it! It is in perfect condition. 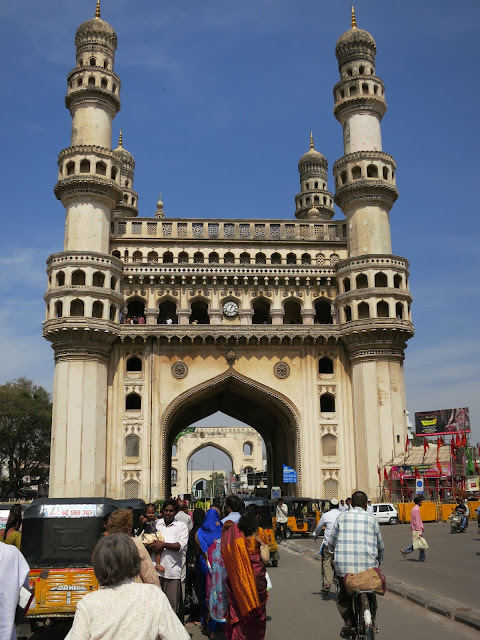 From the palace we walked the crowded streets, dodging traffic to the Charminar. The name is from the Hindi or Urdu Char = 4, Minar= Towers. It is the iconic symbolic heart of old Hyderabad. The congestion around it is frightening. 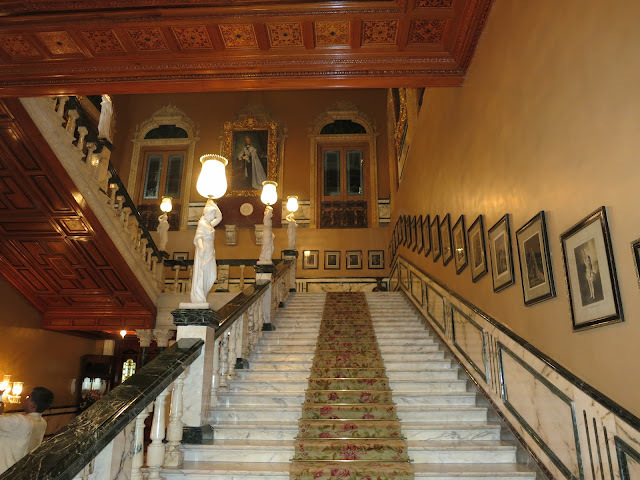 I climbed to the top going up the narrow winding stairs, hoping I would make it without slipping. Upon reaching the top of the tower I was rewarded by an amazing view of the city. After dropping off Ferris and Courtney at the airport, we returned to our Palace and had drinks on the patio as the sun set over the city. Once again the Qawwali singers sang their praises to Allah, an uplifting experience. We were disappointed that we could not spend our last evening at a the hotel dining on the patio because it had been previously booked by a large group. 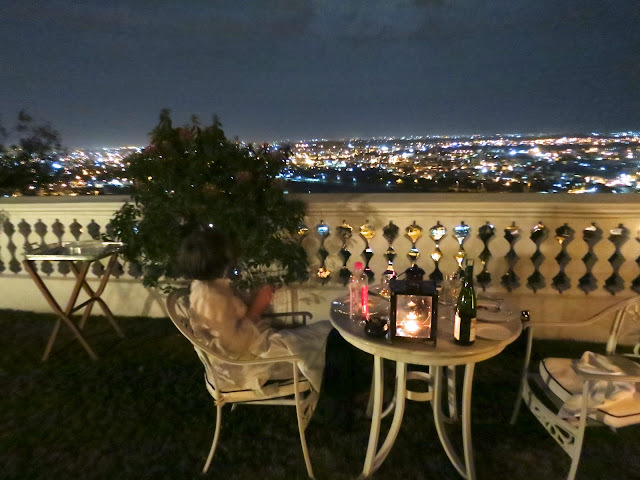 Remembering that there was a small garden overlooking the city near our room, we called room service and asked to dine in the garden. They immediately sent over a butler to make the arrangements. This is the type of challenge the Taj lives for! The butler procured a lamp for our table and we discussed potential menus. 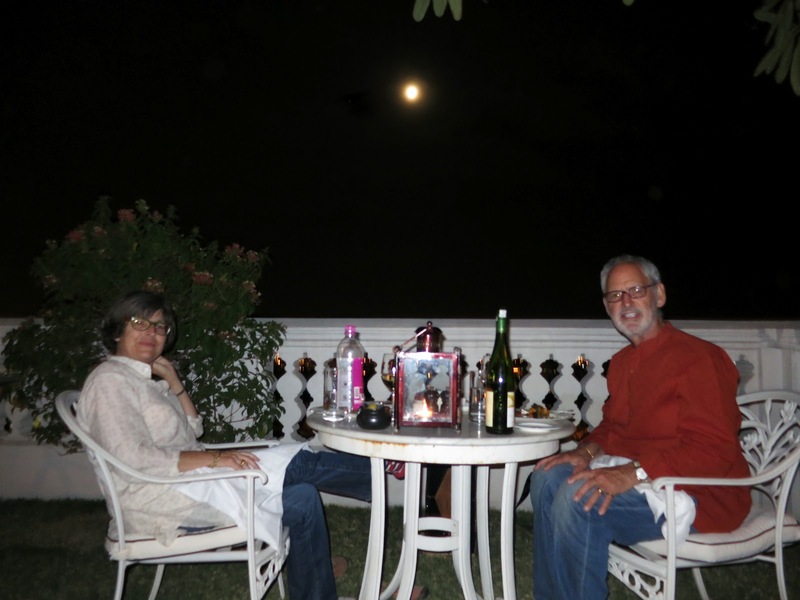 In no time at all, we were seated in the garden, which was bathed in the light of the full moon, and served dinner by our own private butler. Thanks for sharing with us great blog. 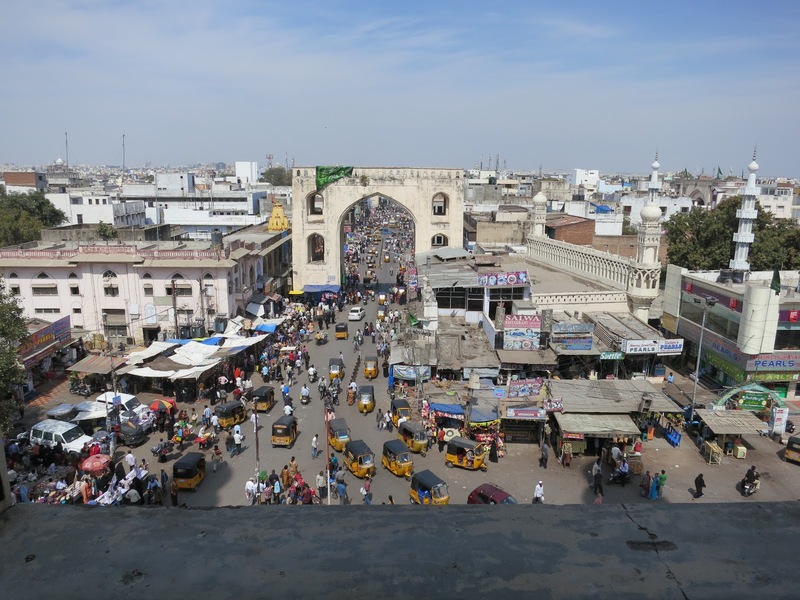 I really like the pictures of Hyderabad.I will discuss this blog with my friends.